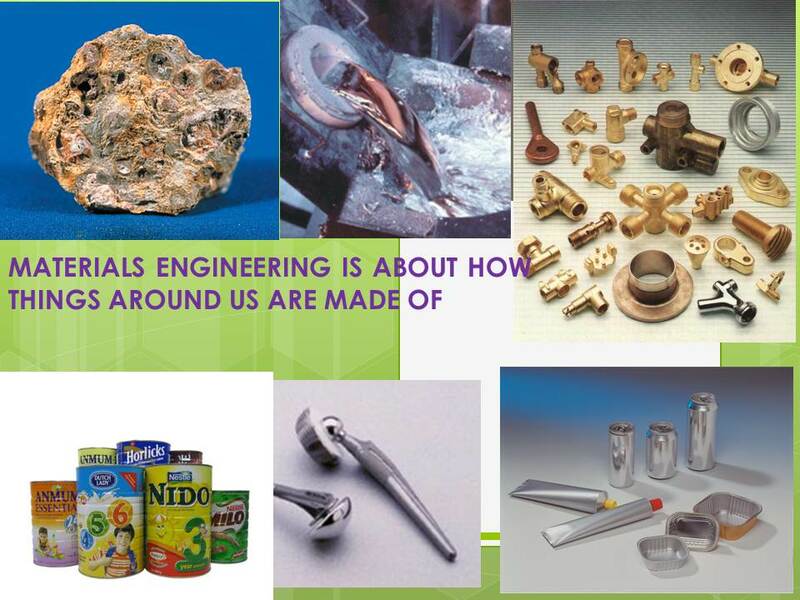 The career of a Materials Engineer calls for an individual with a deep understanding of the basic knowledge in science and engineering of materials and able to relate the characteristics, structure, properties, processing and performance of materials in accordance with their use and demand and in conformance with the development in technology. In fact, a Materiasl Engineer is directly involved in the aspect of material selection, quality control, component failure analysis and Research and Development (R&D) in new materials. Every product to be produced, from design to processing system will require materials which usually consist of metals, polymers, ceramics or composites. Hence, the role of a Materials Engineer will be crucial especially when it involves selection of suitable material and processing. Career opportunities for graduates in this field are very wide including metal and non-metal manufacturing industry, quality control, research (R&D), consultancy and education. Thus, the career in the field of materials engineering is wide open covering all sectors-public, statutory and private sector. This covers the automotive, manufacturing and factory, processing, research and development, service and consultancy, petroleum and petrochemical industry, electronic and semi-conductor as well as the aerospace industry. In moving towards an industralised nation, the role of a Materials Engineer will be very important especially in producing advanced materials. This course provides the physical basis linking the structure of materials with their properties. It describes the microstructure, transformation and properties of metallic materials using solid state physics and chemical thermodynamics. Understanding the link between materials structure and mechanical properties will be discussed through the use of the theory of crystallography. This course provides understanding of the mechanical behavior of engineering materials (metals, ceramics, polymers and composites) and the types of materials failures encountered during service. Equipped with this understanding, materials engineers would be able to select suitable engineering materials for a particular product design. In this course the main techniques used for analyzing and characterizing engineering materials for their structure will be discussed. Materials characterization provides understanding of the link between physical/ chemical properties, structural features and processing of materials and is of great importance to successful product development and quality control. This course covers advances in structures, properties, processes and applications of engineering materials through advanced technology. Students will be exposed to the latest technological innovations of advanced materials, processes, processing techniques as well as areas of applications and use. In addition to selecting a suitable engineering material for a given product design, the processing method by which the selected material will be fabricated is also of crucial importance to ensure that the final product conforms to the design specifications. This course introduces the various processing and fabrication techniques of engineering materials such as metal casting, deformation processes, joining methods, powder metallurgy and processing of microelectronics. Corrosion is concerned with the degradation and failure over time of all engineering materials due to their exposure to various environments such as seawater, atmosphere and chemicals. Apart from the high cost of repair, the corroded structures may also endanger people’s safety and result in loss of life. This course will expose prospective materials engineers on the importance of understanding the principles and mechanisms of corrosion and methods to control corrosion. Materials engineers are often required to undertake technical tasks such as predicting the expected service life of engineering components. They are also required to work with other engineers to design products or manufacturing processes. Materials selection covers all aspects related to the concepts and methods of selecting suitable material for a given mechanical design. The influence of elements such as cost, sustainability and environment on materials selection will also be discussed.